Steven (Chicagoland, United States) on 13 March 2019 in Plant & Nature and Portfolio. Agave guiengola, common name "Creme Brulee Agave", is an evergreen plant belonging to the family Asparagaceae. This species is endemic to the State of Oaxaca, Mexico. It grows on limestone slopes, at an elevation of about 100–1,000 metres above sea level. This particular one was about four feet tall. Photo captured on February 2, 2019 at the Garfield Park Conservatory in Chicago, Illinois. "Creme Brulee Agave." What a delicious name for this humongous plant, Steven. Wow...this Creme Brulee is really large. Waouh ! Quelle taille impressionnante !!! That is one big succulent. Beautiful composition with this "crème brûlée agave "! Wow that is a big one a very nice garden there . Whe have this plants see in a garden on Cran Canaria . An intimidating size compared to those surrounding. Beautifully composed. I just finished another episode last night about cenotes in Yucatan. WOW. It is amazing to see a plant that size. And it is very very attractive. Des plantes impressionnante. Superbe image! Wow.... extraordinaire !.... Très très beau. Une très belle composition , j'aime. Great moment, catching the monemt how the boy looks surprised: "that big"
Magnifique ! Le garçonnet semble très intéressé ! Those agave are huge! Amazing image. That agave is huge. What a gorgeous cactus garden! I love cactus plants. So many interesting shapes. A beautiful image. I have seen these plants before but never one this big. It's impressive. Cool shot. Just look at the size of that plant! Impressive. 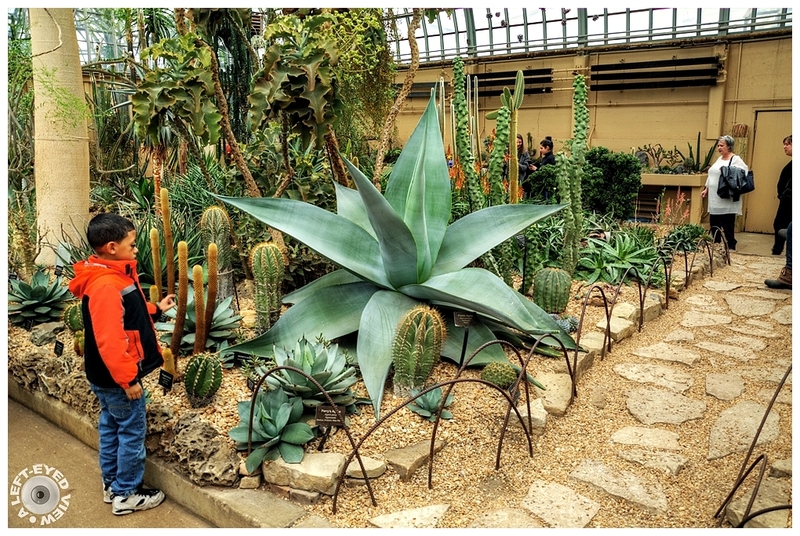 The presence of the kid, allows us to really have the idea of scale of the size of the plant. Those things are massive!! And beautiful... Nice shot - the boy certainly adds scle!